Champa Garden is a living example of how Yelp.com has helped small businesses grow. Living just a few blocks away from this gem, I have seen restaurant after restaurant fail at this location. When Champa first opened, I simply wondered how long it would be before it became a donut shop again. So, imagine my surprise when I hear all the buzz about Champa on Yelp! Still, despite the positive feedback, my skepticism kept me at bay. It actually took me another year before I finally decided to give the place a try. Trust me, its predecessors did give me more than enough reasons to stay away. To be honest, it took a Restaurant.com coupon to give me that final push to go, and I'm so glad that it did. I purchased a $25 gift certificate for only $2 - tip: look out for sales at the end of the month, just Google "restaurant.com coupon codes". The restriction for this coupon is that you have to go during dinner and have to have a minimum of $35, including alcohol. A 18% tip will also be added to your check. As I walked into the restaurant, the overall environment definitely exceeded my expectations. While the restaurant had no more than 15 tables, its was decor was simple yet perfect for the space. 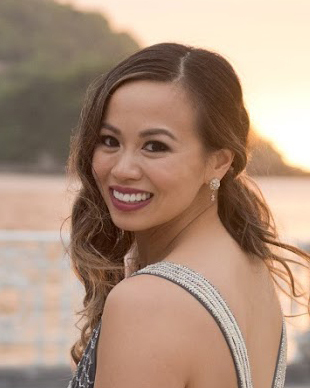 Dim lights helped set the mood: first-date material or perfect to unwind after a long day. Now, on to the good part: the food! My overall impression of Champa is that while everything on the menu was a hit or miss for me, the few stars of the menu will keep you coming back for more. This was definitely the highlight of the entire meal as the highly recommended "Fried Rice Ball Salad" stole the show. This sampler also included Laos Sausages, Fried Spring Rolls, Vermicelli Noodles served with a side of red lettuce, mint, cilantro and a garlicy sweet fish sauce. The addition of the lettuce made this whole appetizer quite refreshing and surprisingly filling. 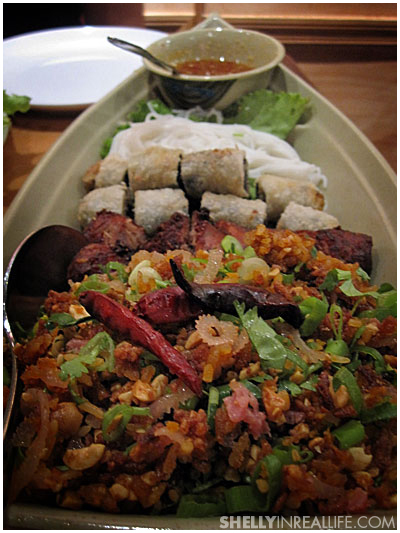 The Fried Rice Ball Salad, despite the name, is not actually balls, but contains crispy fried rice and pork. The Laos Sausage had a unique lemongrass flavor, unlike any other sausage I've tried before. My friend thought it was a tad on the spicy side though, I believe it's due to the massive amount of white pepper that is added into the mix. The Fried Spring Rolls were actually wrapped in rice paper, which made it more distinct than the usual egg roll. This sampler is a MUST. Typical Spring Rolls you would find at any Vietnamese restaurant, except served with the same garlicy sweet fish sauce from the sampler. 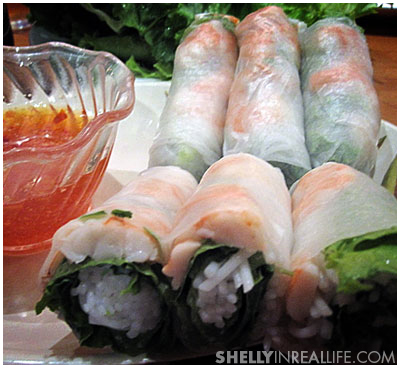 If you love fresh spring rolls, then this is perfectly made. For me, it was nothing spectacular and I wouldn't order it again. 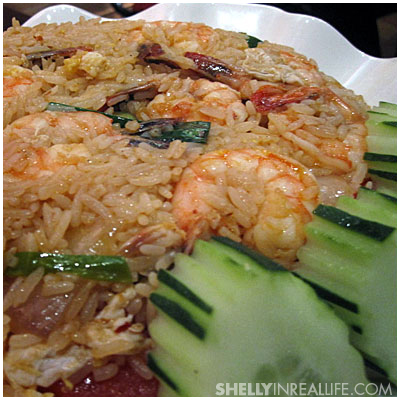 As a self proclaimed Tom Yum lover, this fried rice really left me hanging. Described on the menu as "Shrimp fried rice cooked in tom yum sauce and onions," I was really hoping that this dish would provide more of the lemongrass flavor that I was hoping to find. Instead, this dish was a bit on the bland side, but it did come with a good amount of large shrimp. I don't think I would order this dish again as well. 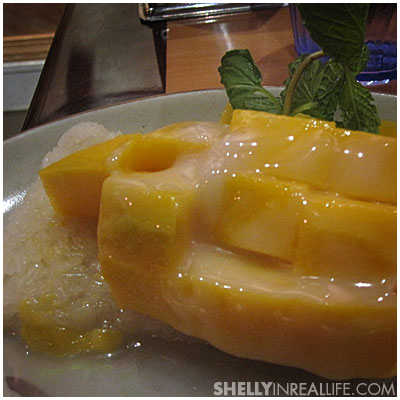 Like any good Thai restaurant, Champa served Mango Sticky Rice as a dessert. Unfortunately, their sugar glaze was quite overpowering and as you can see, didn't make the dessert too visually appealing. Pass. After a few disappointed dishes, Champa ended things with a bang with this dessert. You can't tell from the photo, but there was actually a generous amount of fried bananas that came with the dish. The dessert was so delicious, that my friend and I actually devoured most it before I stopped to realize that I didn't even take a picture yet. 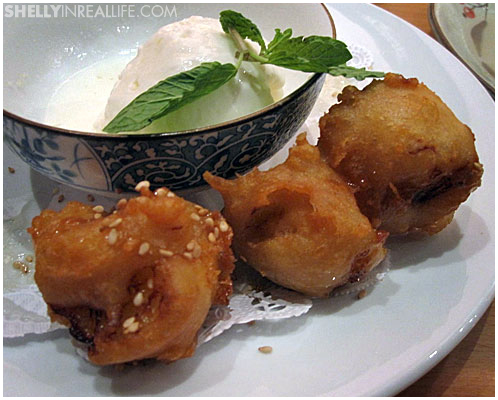 The bananas were lightly fried, to a crispy perfection and the coconut ice cream was a perfect complement. This is definitely another MUST for me. As I drive by Champa pretty much every day, I see that the restaurant is always busy, so be prepared to wait for a few minutes. It is also in a "ghetto" Oakland residential area, so don't expect to take a stroll around the area after dinner. On the other hand, rest assured, I have not heard of any incidents occurring in the vicinity of the restaurant. If you're ever in the area, I would definitely say come give Champa Garden a try, and please order the Sampler and Fried Banana dessert. You can thank me later.